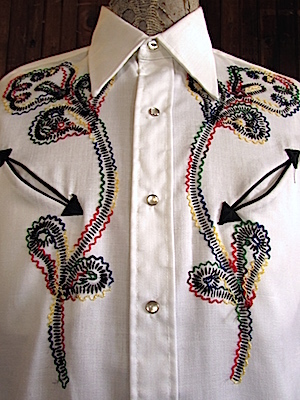 Home > Vintage Western Shirts > All Vintage Western Shirts > (L) Mens Vintage Embroidered Western Shirt! Rainbow Flower Embroidery! 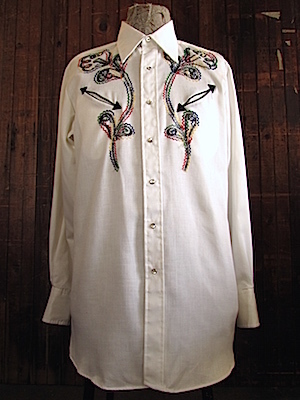 Mens Vintage Embroidered Western Shirt! 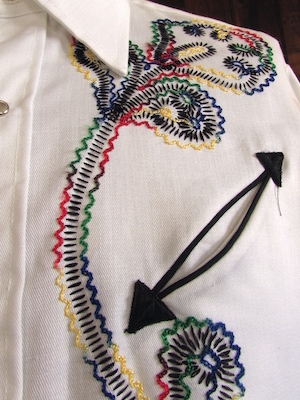 Crisp white with bright rainbow colored (red, yellow, green and blue) embroidered flower design on both sides of the chest and swirly embroidered design on the collar. Pearly white snaps down the front with four more on each cuff. Black piping down the both sides of the button placket. Smile pockets with black piping and arrow tips on either side of chest. Round-tapered hem. Tag reads Sears Western Wear. No material tag but feels like a cotton blend.